To celebrate Earth Month 2019, Appalachian is hosting more than 25 free events during April to promote sustainable practices in people’s lives — environmentally, socially and economically. Earth Month is a national effort focused on awareness of sustainability, conservation, and making the world a better place for future generations. Earth Day, celebrated on April 22 each year since 1970, evolved into Earth Week, and then Earth Month as interest and concern for our planet grew. As Mountaineers, we strive to make every day Earth Day through programs, events, and awareness of the fragility of the world around us, and we also observe Campus Sustainability Month in October to educate new students about Appalachian's tradition of sustainability. Throughout the month, the university will feature programs and seminars related to these larger themes, including zero waste, climate disruption, alternative energy and technology, local food and food insecurity, conservation, and social justice. 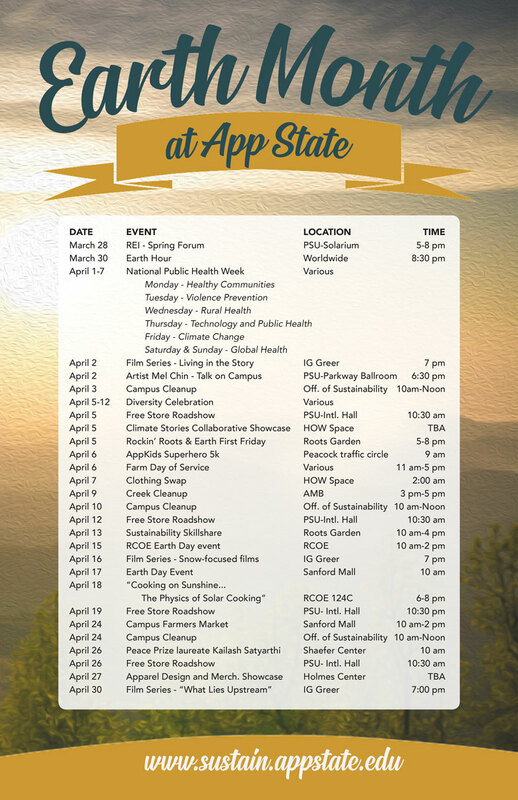 To view more sustainability related news and events head to today.appstate.edu.